There are so many amazing foods out there that become inedible when you’re on low FODMAP, in particular breaded, fried food, and veggie burgers. Why veggie burgers? Because they’re often full of soy and beans, which are “no-no’s” on the elimination diet. Well, I’ve been tinkering with a few recipes that I thought I had to give up, and I’m finally ready to share them! I wanted to make a classy meal for my husband and I, so I opted to alter Chicken Parmesan. 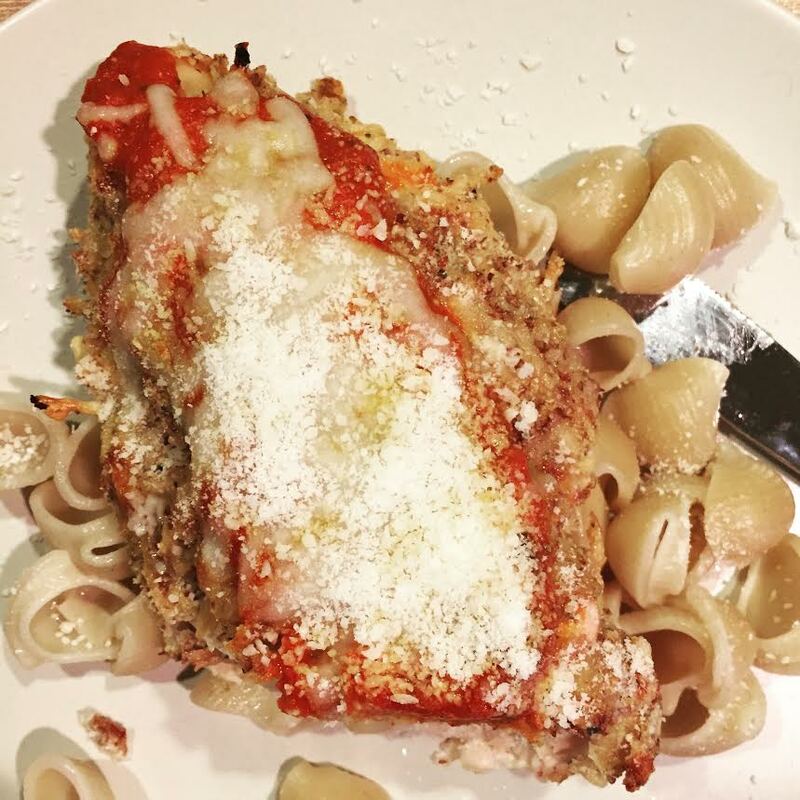 Chicken Parmesan is this delicious breaded cheese laden dish. I didn’t want to coat the whole thing with gluten free flour or bread crumbs (see my previous post about my hatred for most gluten free baked products), and realized that almond meal could help make an amazing breading! Finally, a gluten free option for those of us who hate most gluten free products! 2. Mix almond meal, salt, pepper, Italian seasoning, and fancy shredded Parmesan in a wide, shallow dish. Place gluten free flour in its own shallow dish, and place beaten egg in its own shallow dish. 3. One by one, coat chicken breasts in gluten free flour, shake off excess. 4. One by one, dip chicken breasts in egg, let excess drip off. 5. One by one, coat chicken breasts in almond meal mixture, shake off the excess. 6. Place chicken breasts on prepared pan and cook for 20 minutes. Turn chicken over, cook for another 5 minutes. 7. Remove chicken from oven, and spoon 1/8 c. marinara sauce over each breast. Sprinkle with shredded mozzarella, and bake 5 minutes or until cheese is melted and bubbly. NOTES: Both Parmesan and mozzarella are considered “hard cheeses” and are naturally lower in lactose. If you still find they are upsetting to you, you can use less cheese or substitute a lactose free cheese of your choice. Another thing I miss about being low-FODMAP is the lack of veggie burger options. Most veggie burgers I encounter are made with soy, beans, or both. Most recipes for veggie burgers also include BEANS! I get it, they are a great binder and great source of protein, but they are intolerable for me. I do not tolerate beans well, so much in fact that I cut beans out about a year before trying the low FODMAP diet. 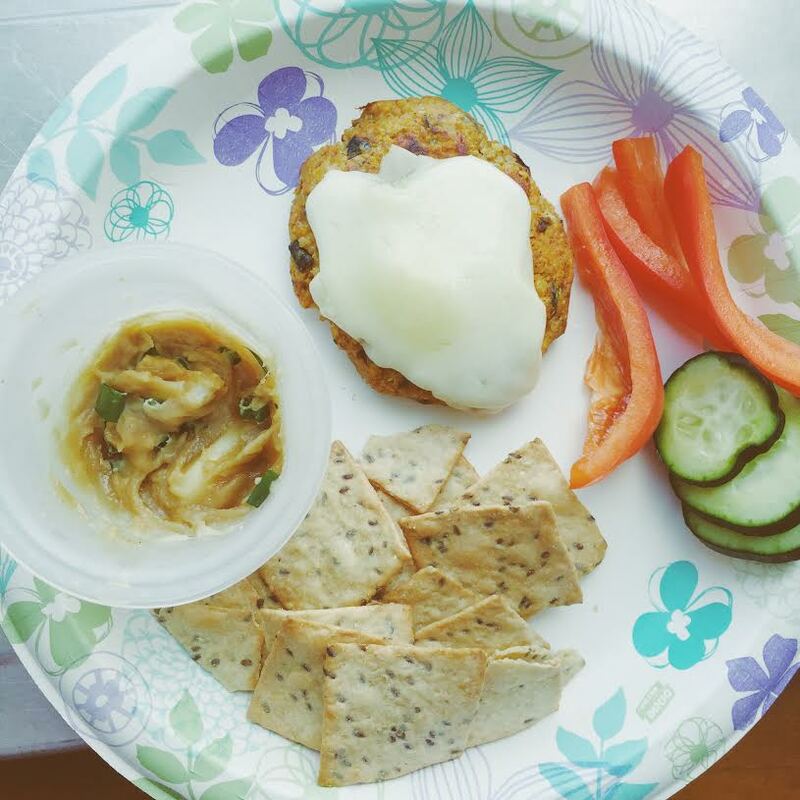 I love sweet potato veggie burgers and decided to experiment! 1. Heat a large skillet over medium heat and add coconut oil to pan. When melted, add in sweet potato, green onion, salt, and pepper, stir, and cover for 10 minutes, or until potato is easily pierced by a fork. Remove lid and add smashed garlic clove, stir for 1 minute, and remove the garlic. 2. Transfer the potato mixture to large bowl and mash until smooth. Add quinoa, herbs, cheese, tahini, salt, pepper, and cayenne pepper, and mix. Once well mixed, add the egg, and mix well to combine. 3. Form the mixture into 4 patties. Heat coconut oil over medium heat in a pan. 4. Add veggie burgers and cook 3-4 minutes on each side, until golden brown. NOTES: I really don’t like quinoa, and if you have an aversion like I do, you could make this with white or brown rice. My aversion has to do with quinoa texture, and I found when mashed into the burger, I didn’t really notice it very much. There you have it! Two low FODMAP meals, both using gluten free options and bean free options!